Figure 1. 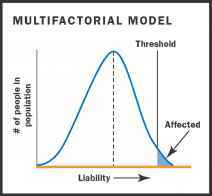 The threshold model for multifactorial traits. The vertical axis represents the number of people with a given level of overall liability. On the horizontal axis, individuals below the threshold do not have the disease, while those above it do. 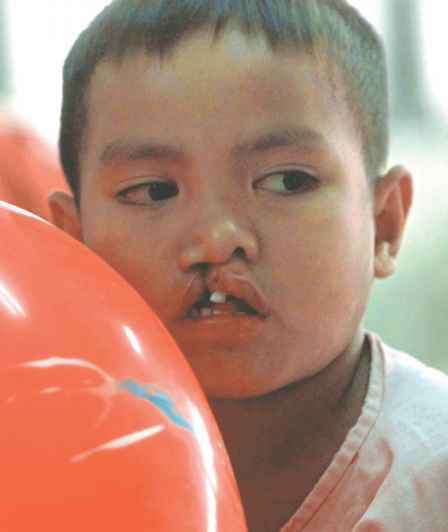 Thawiphop Phimthep waits for his surgery to fix his cleft lip and palate in Si Saket Hospital in Sisaket Province, Thailand. Thawiphop's surgery will be performed by a group of plastic surgeons from Bangkok. brain and spinal cord. Failure of the neural tube to close, which normally occurs during in the fourth week of gestation, results in an NTD, usually spina bifida or anencephaly. Spina bifida ("open spine") is a defect of the spine. The most common form of spina bifida causes some degree of leg paralysis, impaired bladder and bowel control, and sometimes mental retardation. Anencephaly is a rapidly fatal condition in which a baby is born with a severely underdeveloped brain and skull. While most NTDs are inherited as multifactorial disorders, a few result from single-gene disorders, chromosomal abnormalities, or terato-gens. NTDs currently have an incidence of 1 per 2,000 births. This rate has fallen dramatically over the past thirty years, due to the remarkable effects of NTD-prevention efforts. Maternal deficiency in folate (a B vitamin) greatly increases the risk of NTDs, but taking multivitamins containing folic acid before conception and early in pregnancy is highly effective in preventing these disorders. High doses of folic acid are needed to help protect the fetuses of women with pregnancies previously affected by NTDs, and for those who need to take certain medications that interfere with folate metabolism.